An official Instant Pot Facebook group for sharing recipes has attracted more than 750,000 members. When Robert Wang was laid off from his software engineering job in 2008, he took his extra time to solve a personal problem that had been bothering him and several of his peers: dinner. Busy with work, Wang said he and his friends would often resort to fast food or takeout at night. "We all had young children at the time and found it rather challenging to fix healthy dinners when we got off of work," Wang recalled. "We all knew those are not healthy for the children, and not a good habit." “From our experience, cooking is not a solitary event. You really cook for your family, you cook for your friends." The result of Wang's tinkering was the first version of a device he calls the "Instant Pot." Equipped with pressure and heat sensors, as well as a microprocessor, Wang said the appliance can serve as a rice cooker, a pressure cooker, a steamer and a slow cooker, among other functions. The device has become a hit. Versions regularly rank as top sellers in Amazon's rice cooker and electric pressure cooker categories, and an official Instant Pot Facebook group for sharing recipes has attracted more than 750,000 members. Earlier this year, the appliance received praise from J. Kenji López-Alt, the James Beard award-winning author of "The Food Lab" cookbook, as well as James Beard award-winning New York Times food columnist Melissa Clark. While other companies also produce "multi-cookers," Joe Derochowski, a market analyst at The NPD Group, told NBC News that the growth of the market has been "dramatic" — 68 percent in the last year and 90 percent in 2016 — and shows no sign of stopping. "There are more and more players going into this market in part because it's hitting on the key needs consumers have," Derochowski said. "I think Instant Pot had a big part to do with that." But while Wang believed in his product, he said it was difficult to bring it to life. The first problem he and his team had to solve was how to prevent novice cooks from burning their food. Their solution, a burn detection mechanism, took months of engineering and "burning a lot of food" to perfect, he said. In total, the team's research, design and development required 18 months to bring their first product to market. 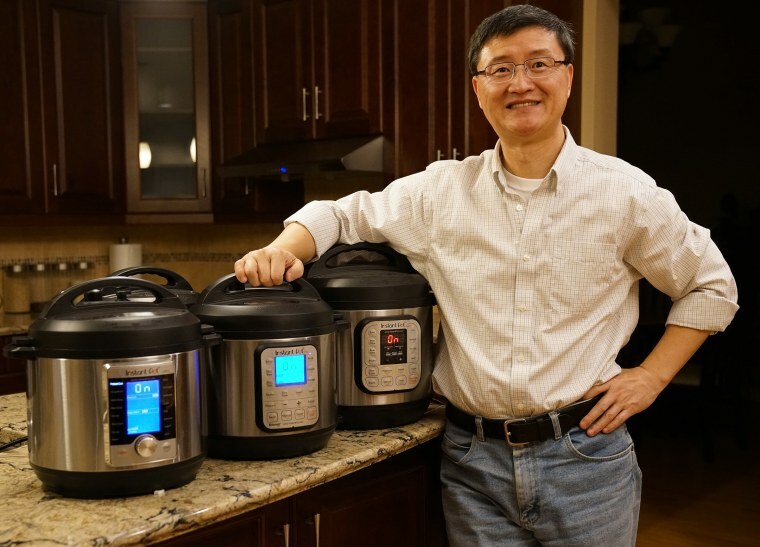 Wang — now chief executive of the Canada-based Double Insight, the company the produces the Instant Pot — calls the first iteration, launched in 2010, the "five-in-one," in reference to the five functions of the device. The latest version is a "10-in-one," updated to include functions such as yogurt making, sautéing and sterilizing. "Every time we add any function, we make it better than anything currently available on the market," Wang said. "We need to make sure that the food produced, that's cooked in this pot, is the most delicious." Wang said that he makes "a lot of Greek yogurt" and that ribs and chili are also among his favorite recipes. Wang's parents-in-law have diabetes, he added, and because his family could be genetically predisposed to the disease, they are taking precautions to consume fewer carbohydrates. Double Insight became profitable in 2012, two years after the release of the first Instant Pot, and according to Wang, it has doubled in revenue every year since. The company sold 215,000 units in a single day last year, he added, as part of a promotion on Amazon Prime Day. But despite the company's success on social media, Wang said he and his team started with no marketing strategy, deciding to let the product "speak for itself," with an additional focus on customer service. "From our experience, cooking is not a solitary event," Wang said. "You really cook for your family. You cook for your friends. When people try your food and they're happy about it, you will be bragging about how you used a miracle appliance like Instant Pot to do the cooking." Wang said he feels grateful to his customers for spreading the word and pays close attention to what they say online. When one customer asked whether there was a way to sterilize baby bottles using the appliance, a sterilization function was added to the next model, he noted. More recently, Wang said he noticed customers from Florida and Texas posting to the Instant Pot Community after hurricanes Harvey and Irma. Wang said that seeing his product help people in need was "really rewarding." While he did not intend for his product to be used specifically for emergency purposes, he said, the goal has always been to help people and families. "Back in 2012, when our sales had reached just over 10,000, we had an internal mission statement," Wang said. "An Instant Pot in every kitchen. That is the objective of the company. We are out to change the world in a positive way."